We skipped breakfast at the hotel in order to have a bite at Westside Lilo’s Café in Seligman. The food and ambience were excellent. Behind the café was a field with lots of classic cars in various states of decay. Naturally, I wanted to photograph them and Gary warned us once again to watch out for rattlesnakes. Then we rode down to the other end of Seligman to the Snow Cap. Gary suggested that I might want to get a shot of Angel Delgadillo who happened to be in town despite being ill and only released from hospital the day before. It turned out that he was being interviewed by the BBC for a series of programmes on Radio 2 celebrating 25 years since ‘The Mother Road’ was decomissioned. I got my shots of Angel (see the photo gallery) and then he left to go home to rest. We had a few minutes in Seligman to visit the shops (last decent stop for Route 66 souvenirs) and Françoise found a Route 66 neon sign for a good price. OK, a neon sign in your own home might seem a tad tacky but neon signs typify Route 66 and were used from the 1930s to advertise companies and services along the way. We just had to have our own neon sign. The vendor didn’t accept cards so I had to use the remainder of my cash. I inspected it carefully and ensured that it worked before packaging it up again and then wondered how we were going get that back home in one piece. I still had photos to take and time was running out so Simon and Viv kindly volunteered to look after it while I went off with my camera. I rushed back to the Snow Cap for our 11am rendezvous to find that it had been delayed – Gary was now in on the BBC thing and was being interviewed by Charles Hazelwood, the well-known conductor. Not surprisingly, when Charles learned that Gary was leading a group of bikers on Harley-Davidson motorcycles across America and that the bikes were just around the corner, he had the idea of ‘conducting’ us as we revved our engines and sounded our horns. Sounding the horn might have been a good idea but the horn on my bike was still an embarassment as it hadn’t recovered from getting wet several days earlier in Oklahoma. It produced a miserable pheep pheep more in keeping with a Puch Maxi moped! We were told that our ‘performance’ could be included in the programmes to be broadcast over three evenings starting on 5th July and might even appear on the BBC web site. Our next stop was Hackberry where there was a general store and disused gas station. It was good to find some shade and rest from the heat which had been building the further west we went. There was much to photograph at Hackberry with lots of abandoned vehicles and all manner of curiosities. We were amused to watch the lizards scurrying about on the ground. Time was moving on and lunch beckoned. We headed off to Kingman for a brief stop at the local Harley dealer before going to lunch at Mr D’z Diner. The diner was decorated inside and out in a striking combination of turquoise and rose pink. Gary suggested that I might want to have my on-helmet video camera ready for the roads after lunch. As soon as we were out of Kingman, the scenery became more dramatic. Once again, we were riding besides a railway line with a freight train made up of four locomotives and over a hundred wagons. We stopped at a small gas station at a place called Cool Springs. It is no longer an active gas station but is now a gift shop and small museum – another victim of the declassification of Route 66 and it being supplanted by Interstate 40. In its heyday, Cool Springs was an important stop to fuel up and get water before crossing the Black Mountains through Sitgreaves Pass. In the early days of Route 66, Sitgreaves Pass was the most daunting section especially to early vehicles with low engine power, poor brakes and poor lights. In fact, some drivers had to traverse the pass in reverse gear or paid locals to take their car over the pass. There were two reasons to use reverse gear. Firstly, reverse is often lower than first and thus gives more power from the small and inefficient engines of the day. Secondly, fuel was gravity fed on those early cars and a steep climb upwards might result in fuel starvation and the engine stopping. So what’s special about Sitgreaves Pass? Well, it’s narrow, there are gradients, there are hairpin bends, there are steep drops right at the edge of the road and few safety barriers. At the top, it is 3556 feet above sea level. Today, the road is better than what is used to be with modifications and some barriers though there is now the added hazard of roaming donkeys (burros) and the risk of donkey droppings making a bike ride more challenging! This was a gold-mining area and the pass was named after army captain Lorenzo Sitgreaves who, in 1851, was tasked with finding a wagon road through the Black Mountains and into California. As an already established trail, it became part of Route 66 but it was a dangerous road. There is a section known as Dead Man’s Curve which is a sharp hairpin with a steep drop that was notorious for accidents. In fact, it is still possible to see wrecks rusting away at the bottom of the slopes. Travellers, unfamiliar with the road, perhaps at night or in rain, may not have realised that the road turned sharply and carried on over the edge. Good road markings and safety barriers were non-existent at that time. Also, the mining companies were losing money as their drivers were being killed or their cargo of ore lost as they went over the edge. There are countless little memorials on that mountainside though, to be fair, some have been added more recently as last wishes rather than because they met their end on that section of road. The mining companies eventually blasted a safer corner through the pass. The reason the burros are here is because they were simply turned loose by the mining companies when they closed down their operations. Today’s burros are the descendants of those that worked in the mines. Descent of the pass takes us into Oatman, one of the original mining towns. It was established over 100 years ago and became a flourishing town of 3,500 after two prospectors struck a $10 million gold find in 1915. Oatman was named in honour of Olive Oatman, a young Illinois girl who was kidnapped by Indians and forced to work as a slave. The main employer in the area, United Eastern Mines, shut down their operations in Oatman in 1924. World War II saw the closure of the remaining mines though the town continued to thrive as it was on Route 66. 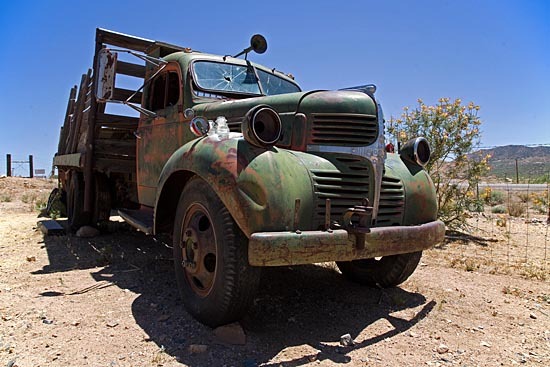 That was until 1953 when it was totally bypassed and Oatman became a ghost town. Today, Oatman is preserved as an example of the early mining towns and it’s sole existence now is for the growing tourism trade wanting to see Route 66. After the shops and restaurants close in the evening, Oatman becomes a ghost town once more. The only thing we didn’t see was tumbleweed blowing down the main street. From Oatman we make our way towards Needles and our stop for the night. The scenery is enjoyable but our riding is marred once again by the low evening sun in our eyes.